On February 9th, 2018 two 6 year old boys came into the Project Watershed office to make a donation to our Kus-kus-sum project. 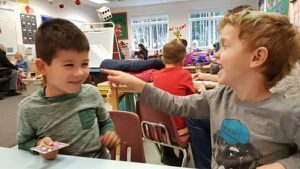 This donation was extra special as these two boys share the same birthday and had a joint party where they asked their friends and family to give toonies instead of gifts. The boys wished to donate their birthday money to Project Watershed to restore the old Field Sawmill site as they pass by the decommissioned sawmill site on their way to school and are looking forward to having that land be turned back to nature. We want to give a big thank you to Jack Keating and Calum Orr, photographed from left to right, for being junior stewards of the Comox Valley. If you have a special occasion coming up and would like to use it to raise funds for Kus-kus-sum contact Project Watershed 250.703.2871 or info@projectwatershed.ca. We can provide you with pamphlets and even make an appearance at the event. Remember any funds you raise will be matched by our Estuary Angel – automatically doubling your contribution! Click here for more information about the Kus-kus-sum restoration project. Film for Thought Screens New Kus-kus-sum Video Cumberland Forest and Friends Raise $5300 for Kus-kus-sum!